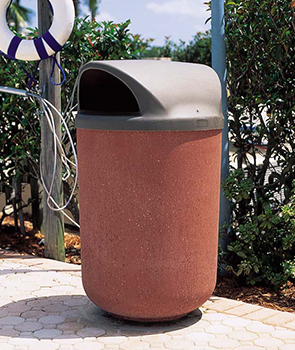 The versatile, durable design of this 31 gallon Round Concrete Trash Receptacle helps promote a clean environment from both sides. Vast color combinations make these concrete receptacles great additions for parks, recreational areas, and marinas. Liners are included with every option to help make trash removal quick and easy. Smooth lid design creates an uneven surface to prevent waste consumption.